Register now for the best days in 2019! 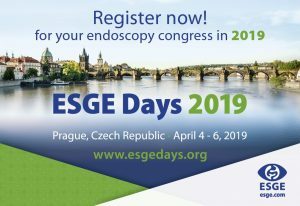 ESGE Days 2019 will take place in Prague, April 4-6, 2019. Developed with you in mind, and catering to the needs of all of the endoscopy team, ESGE Days brings together an exciting programme including live demonstration, lectures, hands-on training, and much more. This is your opportunity to be at the forefront of endoscopy. Participants at ESGE Days 2019 can select extra features to customize their schedule to reflect their training requirements. For more information about registration rates and to sign-up, visit this link. Visit the ESGE Days 2019 website to learn more about what we have in store for you in Prague! ESGE looks forward to seeing you there!